Corals are the primary builders of the reef, providing its three dimensional structure and habitat for other reefs. We study different coral species, their frequency, size, levels of tissue mortality, and their susceptibility to bleaching, disease, predation and competition. 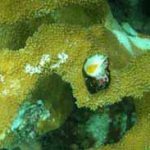 There are about 62 coral species in the Caribbean and their abundance varies by reef type, depth and geographic location. Shallow reefs were once dominated by branching corals (Acropora palmata); shallow fore reefs had abundant A. cervicornis; while deeper fore reefs had mostly Orbicella and Agaricia species; but their abundance has changed significantly since the 1970s. Corals are colonial animals and can have a single polyp or a colony of thousands of polyps. Each polyp is a tubular sac-like body with a ring of tentacles surrounding their mouth. 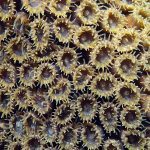 Polyps range in size from 1-3 mm in diameter for colonial corals to 25 cm in solitary corals. Multiple polyps are linked by a common gastrovascular system (“stomach”) through which they share food, water and wastes with surrounding polyps. Species & Abundance – Corals have different colors, colony sizes, and growth forms such as branching, mound, brain, plate, fleshy and flower. We are evaluating the presence and frequency of corals on different reef types to help understand their condition and distribution. Corals, through their calcification (deposition of calcium carbonate), are the structural building blocks of reefs. 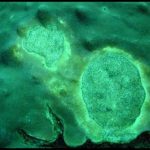 Coral growth is a combination of two processes -development of new polyps and production and accumulation of skeletal mass. Growth can vary with natural factors like coral species and water depth. Many disturbances interfere with a coral’s growth such as disease, bleaching, predation, competition, sediments, nutrients, storms, human damage and ocean acidification. 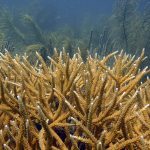 Coral Size –How do you know how old a coral is? 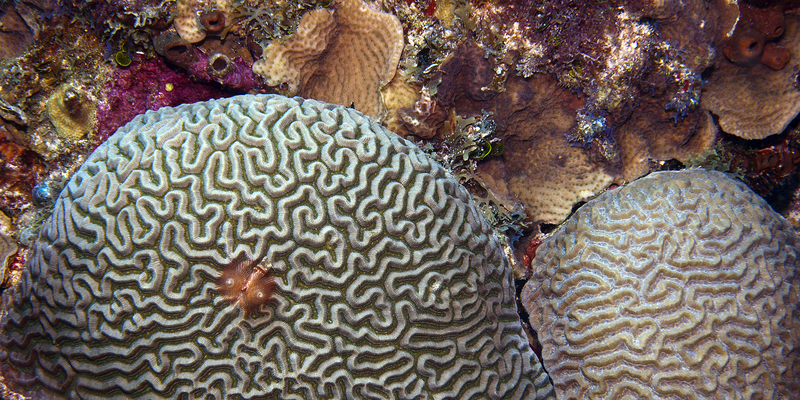 We look at a coral colony’s size as a proxy for age to understand population dynamics. 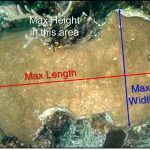 Coral size varies naturally by coral species, reef type, water depth and disturbance. Size can be measured as maximum diameter, width and height. Size frequency distributions are used to track mortality, regeneration and survivorship. 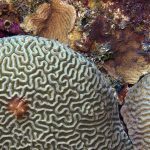 Estimates of colony size (including standing dead) can provide information on reef rugosity and complexity, contributing to our understanding of its value as a three-dimensional habitat.The number and size of corals also helps us understand the stability of environmental conditions or level of disturbance. Many corals, especially mound-shaped corals, grow slowly (~1cm per year), while branching corals grow faster (~10 cm per year). Next time you look at a coral, look at its size and think about how long it has taken to grow that big. Did you know that a coral can be both dead and alive at the same time? 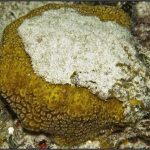 Corals are unique in that they can experience partial tissue death and still remain alive. As corals grow, they are exposed to disturbances that can cause part of the colony to die although the rest of the colony continues to live. Corals have an amazing ability to regenerate new tissue over small areas of tissue loss, but if the extent or severity of mortality is too much, then the dead skeleton areas become overgrown by algae or other bioeroding organisms. 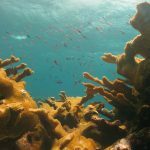 We look at how healthy a coral’s tissues are and measure the amount of healthy or partial mortality of a coral colony’s surface through visual observations. 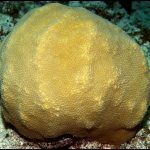 Healthy corals have tissues intact with few signs of damage. Small corals often tend to have no or very low partial mortality, while larger colonies often have greater partial mortality (as a result of being exposed to more disturbances). Recent coral mortality refers to when a coral’s tissue has recently died, but the underlying corallite skeletal structure is visible and identifiable to species. Recent “new” mortality appears white (having died in past minutes to days). Recent “transitional” recent mortality has corallite structures that are often covered with a thin layer of algae, sediment or bacteria (having died in previous days to months). 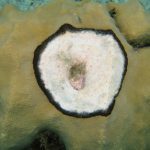 Old mortality refers to any non-living parts of a coral in which the corallite structures are either gone or covered over by organisms that are not easily removed (e.g., algae, sponges). The coral’s soft tissues likely died within the previous months to years to decades. 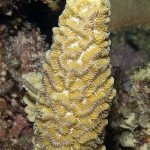 Standing dead refers to colonies that are completely or 100% dead and identifiable to generic level based on colony morphology (e.g., Acropora) or corallite character (e.g., Diploria species). Although corals may be 100% dead, they still provide important habitat for other reef creatures. 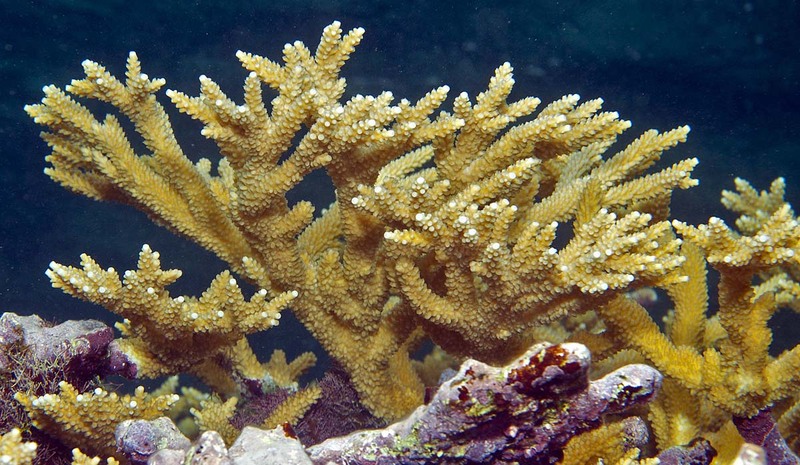 Similar to people and other animals, corals are susceptible to numerous diseases. Coral diseases are impairments to a coral’s normal condition and are a signal of stress. 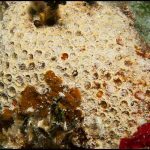 Diseases can cause partial tissue mortality, interfere with a coral’s ability to grow or reproduce and result in colony death. 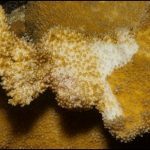 What causes coral diseases is not clear, but outbreaks have been linked to stresses such as high sea surface temperatures, pollution and sedimentation. Diseases have caused widespread mortality of important reef-building species in the past (e.g., white band disease affecting acroporids). Black band disease has a discrete dark black or maroon colored band or fuzzy, filamentous bacterial mat dominated by cyanobacteria at the interface of live tissue and dead skeleton The band can be concentric or linear and be ~1-30 mm wide. 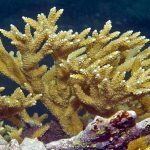 White band disease is found on Acropora species. A distinct band of white, exposed skeleton or bleached tissue separates healthy coral tissue from exposed or algal covered skeleton. The band can be a few mm to several cm wide and advances from the colony’s base towards the branch tips. Yellow band (or blotch) disease has a small yellow or white ring surrounding recently dead tissue and becomes larger as the disease expands outward killing healthy tissue. 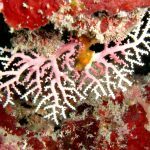 Coral animals are sensitive to changes in sea water temperatures and other disturbances. 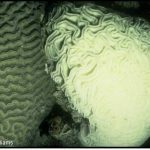 Coral bleaching results when the symbiotic zooxanthellae (single-celled algae) are released from the original host coral due to stress (e.g., unusually high or low temperatures, high or low salinities, or excessive sedimentation). The coral loses its pigment (color) when the zooxanthellae are expelled. 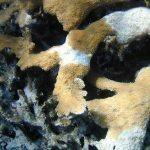 Bleaching can inhibit the ability of coral to recover from small-scale tissue damage; increase partial or total mortality; reduce reproduction success; or increase susceptibility to disease or other stresses. However, corals can die if the stress lasts for an extended period of time or is very severe. Bleached tissue may appear white (translucent) or pale, but you can still see the polyp tissue above the skeleton. Bleaching is not always uniform, but may be mottled in appearance. 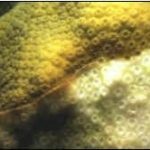 Polyps are not always killed by temporary bleaching, but often regain their pigmentation after several weeks or a few months. 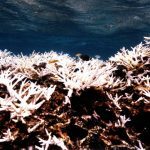 Mass, widespread coral bleaching events, due to elevated sea surface temperatures, have resulted in high coral mortality. In the Caribbean, past mass bleaching events occurred in 1995 and 1998 affecting the western Caribbean and Bahamas; 2005 in the central and eastern Caribbean and again in 2010 and 2015. The intensity and frequency of bleaching events have increased over the last decades and continue to pose a threat. Many other marine organisms compete with corals for reef space through predation or competition. Some fishes and invertebrates eat stony corals either intentionally or incidentally while grazing algae. Predation, the feeding of one organism by another, results in coral tissue mortality. 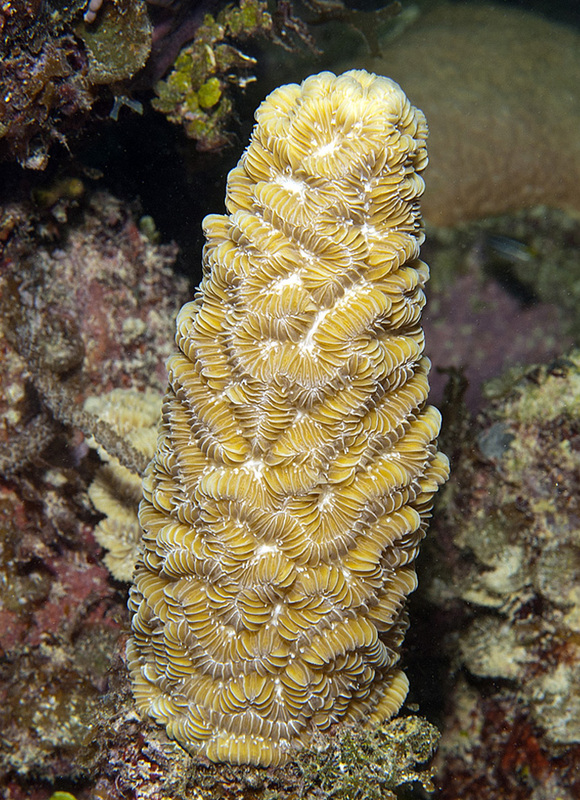 Corallivores directly feed on corals and include species like worms and snails. 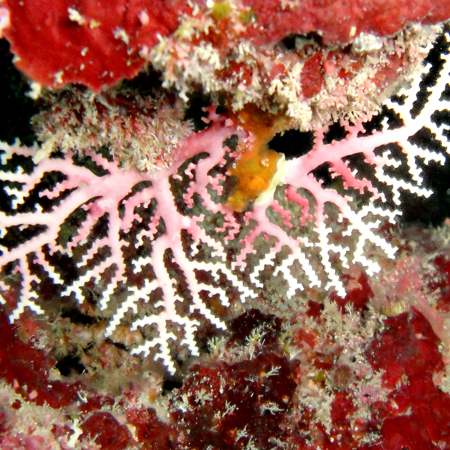 Corallivore densities can be very high if their own predators are overfished. Other species like fish, algae, sponges and other corals will overgrow and kill corals in order to find suitable growing space. Coral-feeding snails (Coralliophila abbreviate) remove tissue in a semicircular pattern. 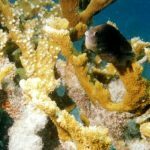 Damselfish & algal gardens – Damselfish cultivate tiny algal turfs that settle on the exposed coral skeleton and compete with corals for space. Parrotfish grazing – As parrotfish graze algae, they can inadvertently scrap or bite into the coral skeleton, leaving shallow scars (1-2cm). 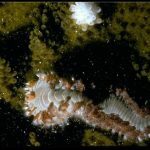 Bristle worms (Hermodice carunculata) often feed at night and expose patches of skeleton or consume entire branch tips of corals.